Another Hollywood offering in the animation category, Pixar’s Incredibles 2, is creating a lot of buzz in India. While the fan base for Hollywood animation films is growing in India, country’s local productions in the genre are not finding many takers. And industry experts believe that it is the lack of narrative and low budget that is impacting the Indian animated films. According to Geetanjali Rao, who is an animator and a filmmaker, Indian cinema in its over-100 year old journey has raised itself to a world class level but animation is a genre that is yet to find acceptability at home. She feels Indian animation films, which are acclaimed at various international platforms, don’t find audiences in India. Indian animated films have not been able to generate the same response as their Hollywood counterparts and the proof of this is their box office performance. The last Tamil full-length animation film, Rajinikanth’s Kochadaiiyaan (2014), failed to create a stir and collected only Rs 70 crore with a budget of Rs 125 crore. Another offering in the animation category Arjun: The Warrior Prince, which is the first animated production in India to be co-branded with Disney, scored a small number at the box office with collections worth Rs 1.78 crore with a budget of Rs 7.50 crore. Chhota Bheem, a successful television series, failed to replicate its success story in theatres. Two films from the Chhota Bheem franchise could not bring audiences in large numbers in cinema halls. 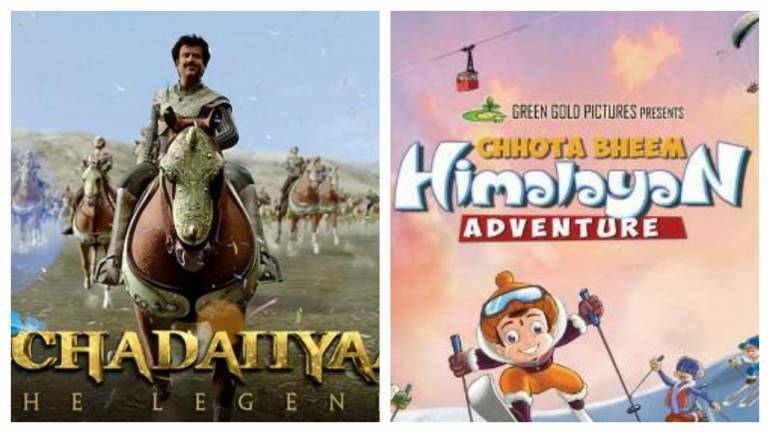 While the 2016 release Chhota Bheem Himalayan Adventure, made at a budget of Rs 5.75 crore collected only Rs 3.90 crore, its predecessor Chota Bheem and the Curse of Damyaan, released in 2012 managed to keep its losses on the lower end by clocking Rs 4 crore at a budget of Rs 4.50 crore. If the mythology theme did not work for Indian animated films, movies that tried to get away from it did not taste success either. Jumbo, starring Akshay Kumar and made at a budget of Rs 21 crore, faltered at the box office with collections at just Rs 2.52 crore. Three other films saw a similar fate. 2010’s Toonpur Ka Superhero with Ajay Devgn made Rs 3.56 crore at a budget of Rs 25 crore, and Roadside Romeo with a budget of Rs 15 crore collected Rs 5 crore. Delhi Safari, made on a budget of Rs24 crore, earned box office collections of a little over Rs 2 crore in India. Only Harry Baweja’s Chaar Sahibzaade, released in 2014 has been an occasional hit that could double its investment with a collection of Rs 21 crore at a budget of Rs 10 crore. Why are Indian animated films finding it difficult to make a mark? The ailing Indian animation industry is troubled with lack of appealing narrative and low budgets. Not much is invested in these films as studios fear low returns. Most of these films are restricted at a budget of Rs 5 crore which is about 0.7 per cent of what a movie like Disney-Pixar’s Ratatouille costs. On the other hand, for a good-quality animation film in India, studios spend nothing more than Rs 8-10 crore. Despite low budgets, the recovery has not been possible given the size of the market. In 2012, a FICCI-KPMG report estimated the entire Indian animation industry’s worth at Rs 1,130 crore, which was very low in comparison to the global USD 122 billion animation and gaming market. Disney alone had animation revenues of around USD 10 billion in 2011. A comparison between India and Japan’s market value of their country’s animation industry shows where the former stands globally. According to a FICCI-KPMG report, Indian animation and VFX market was at Rs 5,950 crore in 2016. On the other hand, Association of Japanese Animations estimated the market value of the country’s animation industry at 2 trillion yen or approximately Rs 1,10,000 crore that year.